Do Not use on coated cable; if used on coated cable, remove coating from assembly area. 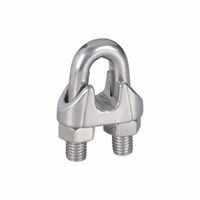 National Hardware Wire Cable Clamp, Series: MP3230B, 1/4 in Opening, Steel U-Bolt/Nuts, Malleable Iron Saddle, Zinc Plated, 2 in Height, 1 in Width, 1 in Length, Federal FF-C-450D, Type 1, Class 2, For Forming an Eye or Loop on Wire Rope Do Not use on coated cable; if used on coated cable, remove coating from assembly area. 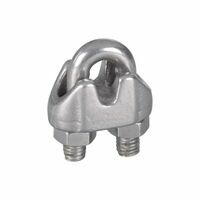 National Hardware Wire Cable Clamp, Series: MP3230BC, 5/16 in Opening, Steel U-Bolt/Nuts, Malleable Iron Saddle, Zinc Plated, 2 in Height, 3 in Width, 4 in Length, Federal FF-C-450D, Type 1, Class 2, For Forming an eye or Loop on Wire Rope Class 2A thread fit. Hot rolled, cold drawn, low carbon steel. Can be cut, heated and bent. Meets ASTM A307 specs. Class 2A thread fit. Hot rolled, cold drawn, low carbon steel. Can be cut, heated and bent. Meets ASTM A307 specs. Class 2A thread fit. Hot rolled, cold drawn, low carbon steel. Can be cut, heated and bent. Meets ASTM A307 specs. Class 2A thread fit. Hot rolled, cold drawn, low carbon steel. Can be cut, heated and bent. Meets ASTM A307 specs. Do Not use on coated cable; if used on coated cable, remove coating from assembly area. Designed to make strong wire rope loops. Not designed for load bearing applications. Follow swaging instructions that are included in package. Class 2A thread fit. Hot rolled, cold drawn, low carbon steel. Can be cut, heated and bent. Meets ASTM A307 specs. Class 2A thread fit. Hot rolled, cold drawn, low carbon steel. Can be cut, heated and bent. Meets ASTM A307 specs. Class 2A thread fit. Hot rolled, cold drawn, low carbon steel. Can be cut, heated and bent. Meets ASTM A307 specs. Designed to make strong wire rope loops. Not designed for load bearing applications. Follow swaging instructions that are included in package. Designed to make strong wire rope loops. Not designed for load bearing applications. Follow swaging instructions that are included in package. For use with wire cable. Designed to make strong wire rope loops. Not designed for load bearing applications. Follow swaging instructions that are included in package. (2) Cable Ferrules and (2) Cable Stops. Made from aluminum.Do not use on coated cable. Designed to make strong wire rope loops. Not designed for load bearing applications. Follow swaging instructions that are included in package. (2) Cable Ferrules and (2) Cable Stops. Made from aluminum.Do not use on coated cable. Class 2A thread fit. Hot rolled, cold drawn, low carbon steel. Can be cut, heated and bent. Meets ASTM A307 specs. Do Not use on coated cable; if used on coated cable, remove coating from assembly area. Class 2A thread fit. Hot rolled, cold drawn, low carbon steel. Can be cut, heated and bent. Meets ASTM A307 specs. (2) Cable Ferrules and (2) Cable Stops. Made from aluminum.Do not use on coated cable. 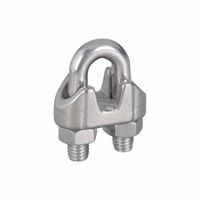 Baron Wire Rope Clip, 3/16 in Opening, Malleable Iron, Galvanized Class 2A thread fit. Hot rolled, cold drawn, low carbon steel. Can be cut, heated and bent. Meets ASTM A307 specs. For use with wire cable. Designed to make strong wire rope loops. Not designed for load bearing applications. Follow swaging instructions that are included in package. Class 2A thread fit. Hot rolled, cold drawn, low carbon steel. Can be cut, heated and bent. Meets ASTM A307 specs. For use with wire cable. National Hardware Wire Cable Clamp, Series: MP3230BC, 3/4 in Opening, Steel U-Bolt/Nuts, Malleable Iron Saddle, Zinc Plated, 3 in Height, 2 in Width, 1 in Length, Federal FF-C-450D, Type 1, Class 2, For Forming an Eye or Loop on Wire Rope Class 2A thread fit. Hot rolled, cold drawn, low carbon steel. Can be cut, heated and bent. Meets ASTM A307 specs. Class 2A thread fit. Hot rolled, cold drawn, low carbon steel. Can be cut, heated and bent. Meets ASTM A307 specs. K & S Round Tube, 1/4 in Nominal, 0.19 in Inside Diameter, 12 in Length, 0.028 in Thickness, Welded, Stainless Steel, ASTM A269, Grade AISI 304/304L, For Plumbing, HVAC and Automotive Class 2A thread fit. Hot rolled, cold drawn, low carbon steel. Can be cut, heated and bent. Meets ASTM A307 specs. Class 2A thread fit. Hot rolled, cold drawn, low carbon steel. Can be cut, heated and bent. Meets ASTM A307 specs. Class 2A thread fit. Hot rolled, cold drawn, low carbon steel. Can be cut, heated and bent. Meets ASTM A307 specs. K & S Round Tube, 7/16 in Nominal, 0.38 in Inside Diameter, 12 in Length, 0.028 in Thickness, Welded, Stainless Steel, ASTM A269, Grade AISI 304/304L, For Plumbing, HVAC and Automotive For use with wire cable. For use with wire cable. Do Not use on coated cable; if used on coated cable, remove coating from assembly area. 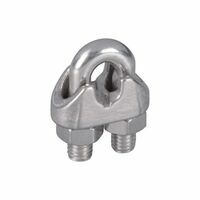 For anchor bolts, clamps, hangers and U-bolts. Class 2A thread fit. Hot rolled, cold drawn, low carbon steel. Can be cut, heated and bent. Meets ASTM A307 specs. Porteous Threaded Rod, 1/2-13 Thread, 3 ft Overall Length, NC Thread, Carbon Steel, ASTM A307, Grade: A, Hot Dip Galvanized For anchor bolts, clamps, hangers and U-bolts. Class 2A thread fit. Hot rolled, cold drawn, low carbon steel. Can be cut, heated and bent. Meets ASTM A307 specs. 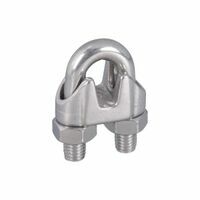 National Hardware Wire Cable Clamp, Weather Resistant, Series: V4230, 3/16 in Opening, Stainless Steel, Zinc Plated, BHMA A138.18, For Forming an eye or Loop on Wire Rope For anchor bolts, clamps, hangers and U-bolts. 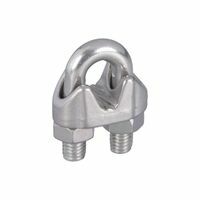 National Hardware Wire Cable Clamp, Weather Resistant, Series: V4230, 1/16 in Opening, Stainless Steel, Zinc Plated, BHMA A138.18, For Forming an eye or Loop on Wire Rope For anchor bolts, clamps, hangers and U-bolts. Extruded constrution. Used for creating eye terminations on cable or wire rope. Stanley Threaded Rod, 1/2-20 Thread, 3 ft Overall Length, Fine Thread, Steel, Zinc Plated Porteous Threaded Rod, 5/8-11 Thread, 3 ft Overall Length, NC Thread, Carbon Steel, ASTM A307, Grade: A, Hot Dip Galvanized Class 2A thread fit. Hot rolled, cold drawn, low carbon steel. Can be cut, heated and bent. Meets ASTM A307 specs. Midwest Self-Tapping Screw, NO 8 Screw, 3/4 in Length, Pan Head, Phillips Drive, Coarse Thread, Steel, Zinc Plated, Used as Metal to Wood Midwest Self-Tapping Screw, NO 10 Screw, 1/2 in Length, Pan Head, Phillips Drive, Coarse Thread, Steel, Zinc Plated, Used as Metal to Wood Extruded constrution. Used for creating eye terminations on cable or wire rope. Midwest Self-Tapping Screw, NO 10 Screw, 3/4 in Length, Hexagonal Washer Head, Slotted Drive, Coarse Thread, Steel, Zinc Plated, Used as Metal to Wood Midwest Self-Tapping Screw, NO 8 Screw, 1-1/4 in Length, Hexagonal Washer Head, Slotted Drive, Coarse Thread, Steel, Zinc Plated For anchor bolts, clamps, hangers and U-bolts. Stanley Threaded Rod, NO 1-8 Thread, 6 ft Overall Length, Steel, Zinc Plated Porteous Threaded Rod, 3/4-10 Thread, 10 ft Overall Length, NC Thread, Carbon Steel, ASTM A307, Grade: A, Hot Dip Galvanized Extruded constrution. Used for creating eye terminations on cable or wire rope.